Vocalist Hilary Gardner and pianist Ehud Asherie have been performing together as a duo for nearly a decade. Their new Anzic Records release, The Late Set, was inspired by their frequent performances in New York City’s Greenwich Village and hearkens back to a bygone era of after-hours music making in tucked-away jazz haunts. 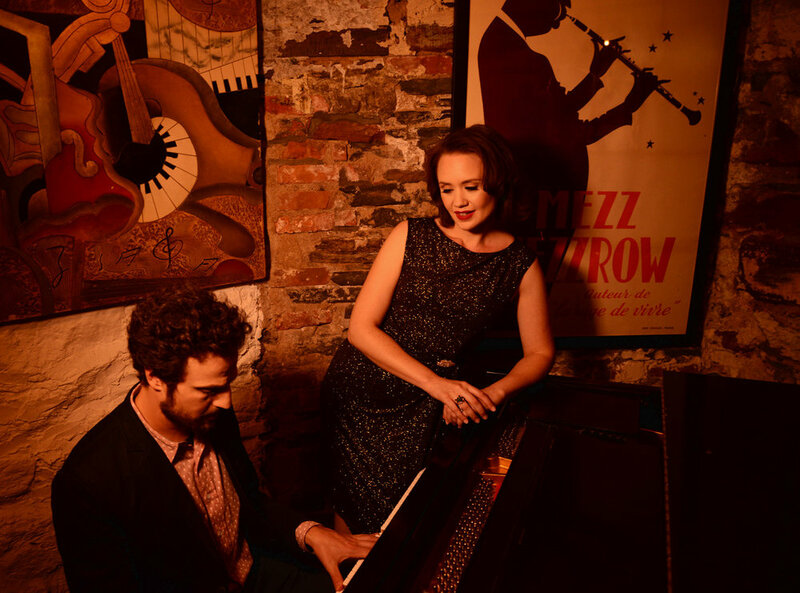 Hilary and Ehud’s mutual love of timeless songs is evident in their intimate, swinging renditions of standards both familiar and obscure by stalwarts of the Great American Songbook, including Harry Warren, Irving Berlin, Rodgers & Hart, Harold Arlen, and more. Hilary Gardner’s debut recording, The Great City (Anzic Records, 2014), garnered effusive praise from the jazz community, with DownBeat Magazine naming her “an artist to watch” and a Rising Star Female Vocalist. In 2010 Hilary was the live, onstage vocalist in Twyla Tharp’s Broadway homage to Sinatra, Come Fly Away. Hilary is a founding member of DUCHESS, a close-harmony vocal trio with two critically lauded albums to their credit. In addition to performing at festivals throughout the United States, Canada, and Israel, the trio has enjoyed sold-out performances at New York City’s Jazz at Lincoln Center, Dizzy’s Club Coca-Cola, and the Rubin Museum. Hilary was Jeff Goldblum’s special guest on the opening night of his run at the legendary Café Carlyle, prompting New York Magazine to call hers “a voice worth seeking out.” She has also appeared on NPR as Michael Feinstein’s guest on Song Travels with Michael Feinstein and Judy Carmichael’s Jazz Inspired on SiriusXM. Ehud Asherie, "a master of swing and stride" (The New Yorker), is a jazz pianist who integrates the venerable New York piano tradition into his inventive style. Largely self-taught, or rather, “old-schooled,” Asherie learned the ropes at Smalls, spending the wee small hours of his early teens becoming a fixture of the late-night jam sessions. From Smalls to the Rainbow Room, from Lincoln Center to The Village Vanguard, Ehud has since worked with a broad range of musicians including: Eric Alexander, Roy Ayers, Peter Bernstein, Jesse Davis, Bobby Durham, Vince Giordano, Wycliffe Gordon, Scott Hamilton, Catherine Russell, Ken Peplowski, and Clark Terry. Ehud's playing can be heard on countless recordings, including the 2010 Grammy Award-winning soundtrack of HBO’s Boardwalk Empire. He recently released his twelfth album as a leader, entitled Shuffle Along (Blue Heron Records), a solo piano performance of Eubie Blake songs from the musical Shuffle Along. "...an absolutely first-class singer..." - Terry Teachout, author of "Pops: A Life of Louis Armstrong" & "Duke: A Life of Duke Ellington"